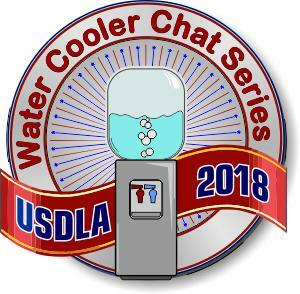 What is a USDLA water cooler chat? 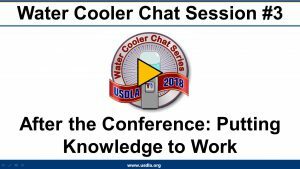 It’s an informal conversation — NOT a presentation — among distance learning colleagues who are visiting with one another around a virtual water cooler. Blockbuster vs. Netflix; Circuit City vs. Best Buy; Microsoft vs. Netscape; Amazon and Google vs., well, just about everyone. When we think of the rise of some organizations and the fall of their competitors, what comes to mind? Senior managers clinging to old ways of doing business that no longer apply? That’s part of it. But there is another way of looking at it. In each case we see once-great companies simply stop learning. Before long, they get out-maneuvered and outwitted by companies that have learning and innovation firmly embedded in their culture. Everyday we witness economic and workforce changes that favor learning organizations. We are also seeing changes in how learning is accomplished. It’s no longer just a question of training (short-term, practical, and focused on helping people do something, or do something better) vs. education (less focused on immediate needs, though more focused on providing a long-term knowledge base essential for developing new abilities). It is also the matter of rebalancing what is learned in the conventional classrooms vs. what is learned, well, everywhere else. But though there are more options than ever for learning new things, the task of actually getting people to learn doesn’t seem to be getting any easier. Topic #1: Consider Figure 1 and Figure 2. Does your organization actively support both formal and informal learning? How? Topic #2: Consider the areas of technology (below) as they relate to learning. How do they impact your organization? Alternatively, how will they affect your clients/customers/staff/students? Topic #3: Consider the way in which learning activity is managed in your organization. How important are interorganizational partnerships? Are there new partnerships you should be developing? Topic #4: What role does Competency-Based Training (CBT) play in your organization? Developing the knowledge and skills of the workforce was one of the core themes of the 2018 USDLA Conference. Several presenters explored this theme through new training designs, business-college-government partnerships, and competency-based programs. Click here to see more information about the conference sessions and presenters that covered this topic. “Perhaps the most promising source of automatically gathered online learning data is the learning software itself, particularly the LMS.” – –Black, E. W., Dawson, K., & Priem, J. (2008). “Data for free: using LMS activity logs to measure community in online courses.” Internet and Higher Education, 11, 65-70. Have you ever had the feeling you’re being watched? Like it or not, it seems like all our actions are logged, tagged, cataloged, classified, grouped, clustered, and otherwise analyzed for the purposes of various marketing campaigns (or worse). On the flip-side, have you ever wondered how you can demonstrate the effectiveness of the distance learning tools and initiatives to a senior management audience that has a severe preoccupation with ROI data? 1. How do we show that the new tools and techniques do in fact support learning? 2. How do we make our students feel like we’re watching out for them, not just watching them? Topic #1: Are you using system logs to help evaluate the effectiveness of your learning infrastructure? Topic #2: Do you have a sense for how your students are adapting to your learning infrastructure? Topic #3: How do you know that your learning infrastructure is aligned with your organization’s strategic goals and objectives? Managing and evaluating learning technologies was one of the core themes of the 2018 USDLA Conference. Several presenters shared case studies about the implementation of new learning systems. Other case studies focused on the use of various metrics (including system metrics) to help learning leaders determine if their infrastructure is meeting organizational needs. Click here to see more information about the conference sessions and presenters that covered this topic. For the majority of people, the most important aspect of attending the USDLA Annual Conference is the prospect of gathering enough information to help meet challenging distance learning goals. In order to help conference attendees squeeze the maximum value from their experience, we held a special one hour post-conference chat. This free session, featuring conference speakers and organizers, included reviews of the major topics and discussions stemming from this year’s event. Topic #1: What were your biggest takeaways from this year’s USDLA conference? Topic #2: What distance learning topics do we as a community need to pay close attention to in the upcoming year?